The holiday season is almost here and that means PARTIES!!! You know you’ll want to look your best so here’s a heads up on a great sale! 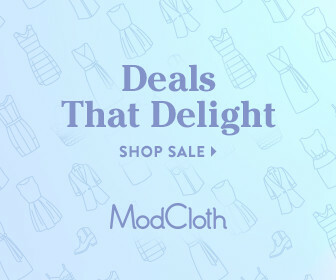 For 48 hours only, ModCloth is putting their Party Dress selection on sale. Head over to ModCloth and check out their incredible selection of cute dresses here: 20% Off ModCloth Party Dresses Until 11/6! And don’t forget ModCloth always has FREE US shipping on orders $50+. The glitzy dress on the left above is the Grooves and Moves Dress that gets some extra WOW from sequins – be sure to check it out while you browse through their dozens of other super-awesome styles. This entry was posted in Fashion on November 4, 2013 by Chrysa.